Okay, I'm going to get totally fangirlish in this thread, just to warn you. :3 I love this game, much to Zane the pure's misfortune. 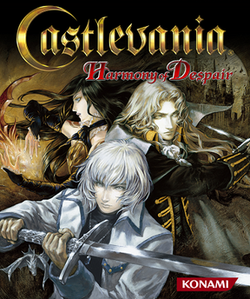 Castlevania HD is a 2D side-scrolling JRPG available only on PSN and XBLA(is that right?). The main purpose of the game is to fight your way through a level full of dangerous monsters and then finally take out a boss at the end. This game...is AWESOME. It's tense, it's hard, it has lots of rewards and items to collect, and it's cheap! Zane the pure bought everything available for the game, and I don't think he spent more than $30 total, DLC included. Anyway, there is a HUGE amount of collectables for this game seeing as every character has their own unique skill and often their own set of items to collect. There are 11 characters to choose from, ranging from various titles of Castlevania. The characters are as follow, Soma Cruz, Alucard, Jonathan Morris, Shanoa, Charlotte Aulin, Yoko Belnades, Julius Belmont, Maria Renard, Richter Belmont, Simon Belmont and Getsu Fuma. Each character has their own set of skills and various ways of powering up as the game progresses. The game functions differently from other titles in that it "throws the feeling of discovery out the window and replaces it with a drive to acquire loot". This game is all about mastering the levels and making your characters as strong as possible, and is more addicting than cigarettes. The game even comes with a Hard mode, complete with even more powerful weapons and armor to obtain, as well as a much more challenging experience than before. HD however, is a double edged sword in the way that you don't need skill in order to get the best items, and instead all you would need is an internet connection and a good team to run with, as well as good luck to get the best drop. Did I mention this game is multiplayer for up to six people for one chapter? Many game reviewers find this to be the best function the game has to offer, and bringing the term, "teamwork" to a whole new level. Having more than one person on your team affects the level as well, combining your luck into one number, making getting items easier or harder depending on who you're running with. It also increases the difficulty of bosses, making the rarest drop for the levels the hardest to obtain. The thrills this game holds are basically limitless in the way that there are tons of items to collect, and 11 characters to power up. You'll be playing this for months before you can utter the phrase, "There's nothing else to do". I recommend this to everyone with a bit of pocket change and some time to waste. Unlike most JRPGs which are hated by a lot of people, apparently, this is not turn based or real time action, but instead, thrilling and difficult 2D side scrolling action at its best. It's multiplayer Super Mario on steroids, people. Zane the pure, Nightmare and I all play it, and I still love it as much as I did when I first played it. It's nostalgic for any old fans like Zane and myself, and always a thrilling challenge. Here are a couple video clips of gameplay. Did we mention that the game itself is 14 USD and the DLC in no more than the game itself for all of it.